For dancers, this month means holiday performances and rehearsals, the start of dance team competition season, maybe even learning the beginning of recital dances. For students, it means finals; for parents, it means holiday preparations in addition to work and family. Combine any or all of this together, and that to-do list could easily make you feel more frazzled than festive. Read on for some ideas to keep your holidays merry and bright, packed schedule and all. In a tech-laden world, unnecessary time-suckers are plentiful. Use that break in between rehearsals to study for finals or order gifts online without diversion. Apps like SelfControl give users the ability to block distracting websites (social media, I’m looking at you) for as long as the user wants. Websites such as KeepMeOut.com also serve a similar purpose. Include rehearsals, performance dates and all other events for the month. If you have older dancers and children, it’s particularly important for everyone to communicate their schedules so everyone is on the same page. For the on-the-go family, a shared online calendar, like Google Calendar, can be great – everyone in your family can see changes made to the schedule or add their own events, right from their computer or smartphone. You will all be calmer if you know where to be when and where you can expect to have free time to plan other activities. Block out time for a breather. You’ll go crazy as quickly as you can say “Nutcracker Suite” if you don’t include downtime for yourself in that schedule. Knowing you have fun and relaxation in your future is a fantastic motivator, and giving yourself that time puts the season in perspective. Check your expectations. No need to become superman/woman for the month of December! If trying to squeeze in homemade cookie baking makes you feel more humbug than happy, just buy some at your local bakery (I promise, the kids at the studio will love them either way). Enlist the kids to put bows on gifts you’re wrapping; tag-team with your spouse or neighbor for studio pick up duties. The holidays are about being together; it becomes work when you feel like you’re doing everything alone. Plan to care of yourself. 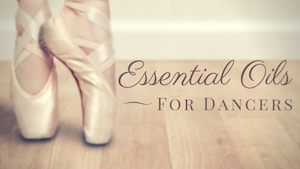 It is essential for dancers to care for their bodies properly, and this busy season is no exception. Preplan (again, this is where the calendar steps in) in case you need to pack some healthy snacks for an extra long rehearsal or an on-the-go dinner for your little dancer. As difficult as it can be, also prioritize sleep – for yourself as well as everyone in your family. There’s nothing like fatigue and hunger to send happiness straight up the chimney. And if the dancer happens to be you, remember that you are doing something that you love – and that will make that busy schedule worth it all through the new year. 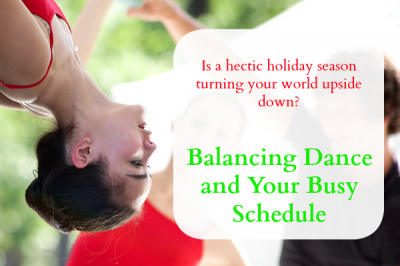 What tools and tricks do you use to keep your holidays more happy and less hectic?